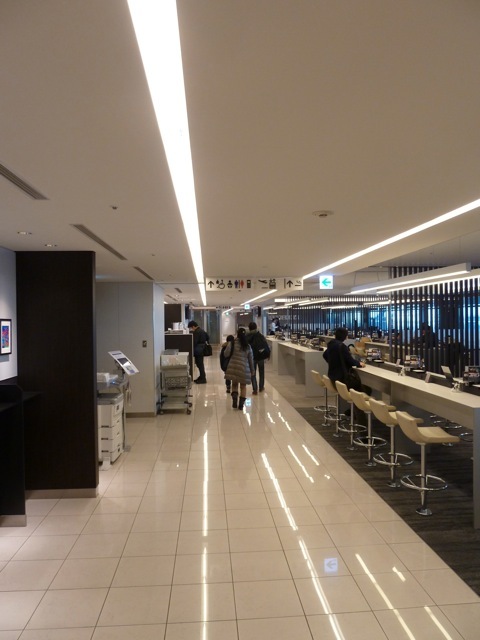 My last post left off with me arriving in Narita from Heathrow yesterday. 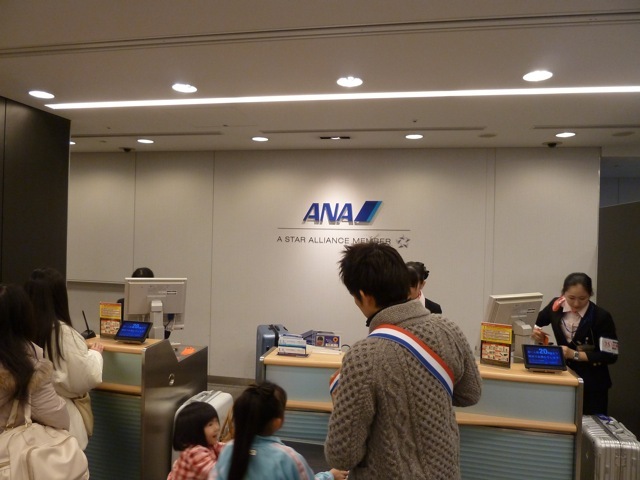 I then had to make my way to Haneda, from where my flight to Ishigaki leaves todays, where I would also spend the night. 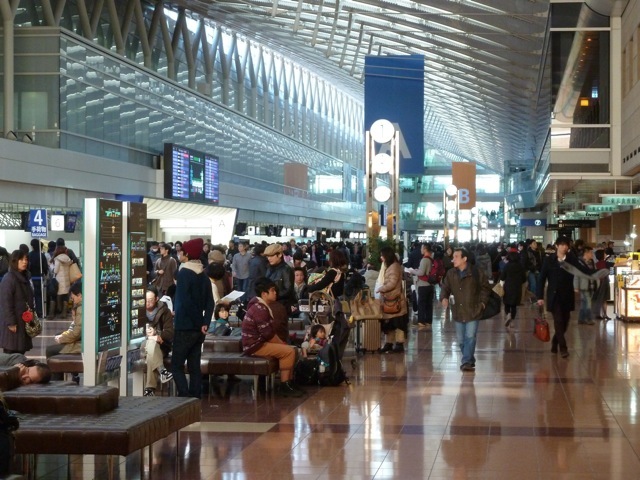 There are three ways to reach Haneda airport from Narita using public transport. First, there is the limousine bus service – not sure where the limousine bit comes in – which runs regularly between the two airports. This can however, be a bit of a wild card. Theoretically the journey time should be around 90 minutes. But traffic in the Tokyo area can be quite bad, significantly increasing the time to make the journey. 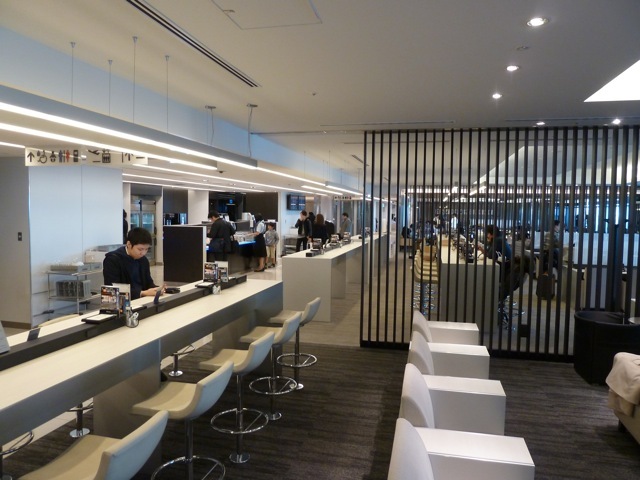 The second option is of course the famous Narita Express, which runs to Shinjuku and Tokyo station and takes a little less than an hour to make the journey to Tokyo station. From there you have to change to a JR Yamanote line train to Hamamatsucho, where you connect to the Haneda monorail service. The Narita Express is certainly the most comfortable way to get into Tokyo, with reserved seating on every train – but obviously with luggage having to change trains twice may be a bit cumbersome. And then, finally, there is also the Kaisei line, which runs a direct train from Narita to Haneda in 92 minutes. The direct trains run every 30 minutes or so but are not near as comfortable as the Narita Express. In Haneda I’m staying at the Excel Haneda Airport Hotel for the night, which has some really brilliant views of the apron and the runway (see below). 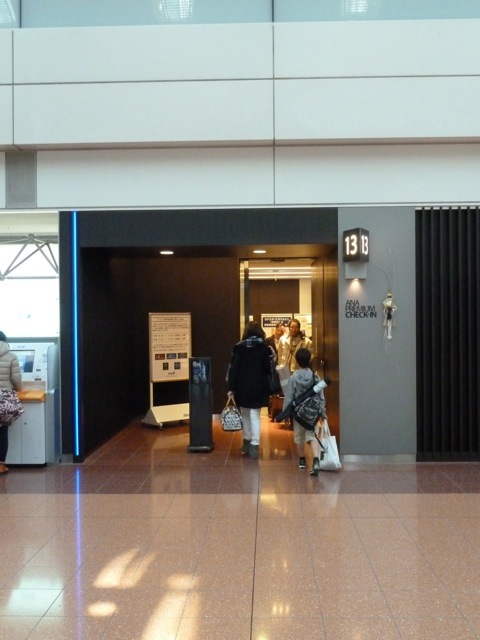 Access to the hotel is via Terminal D2. 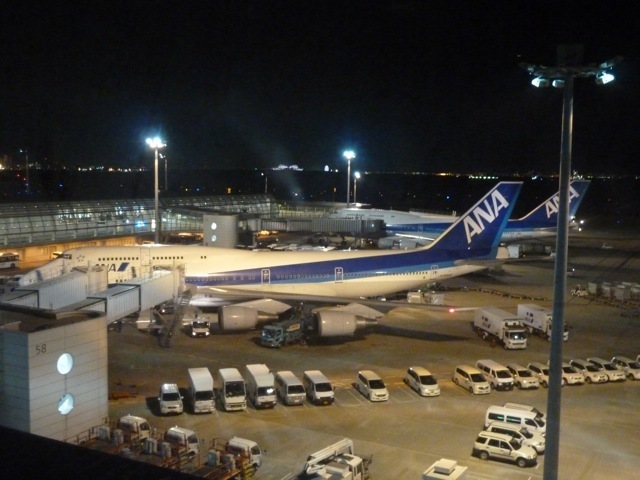 The Boeing 747-400 will leave the ANA fleet on 29. March 2014. I’m assuming that most of you will not know where Ishigaki is, which is why I’m adding a map pf the journey so far – courtesy of the Great Circle Mapper. I exit the hotel at the far end of the departure concourse. The terminal is crawling with people. This is after all, the main holiday season in Japan. There are people everywhere, with long queues. 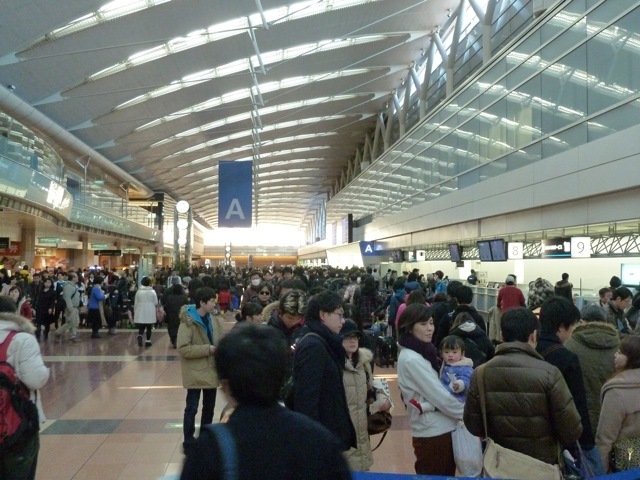 But in typically Japanese fashion, the queues are orderly and move along efficiently and swiftly. 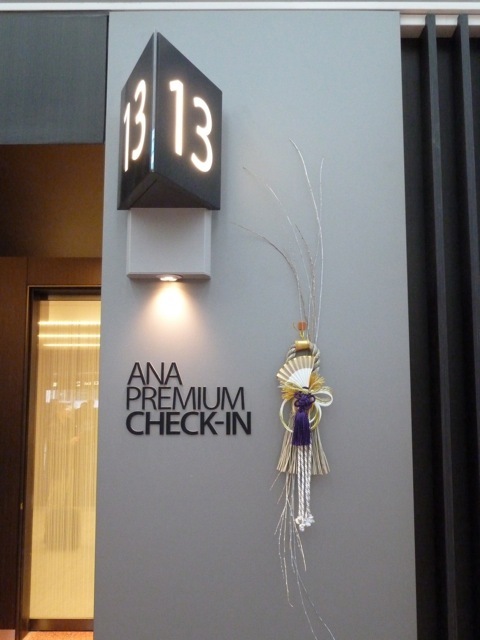 There is a segregated check-in area for status card holders and passengers travelling on one of ANA’s Premier Class services, with direct access to security. 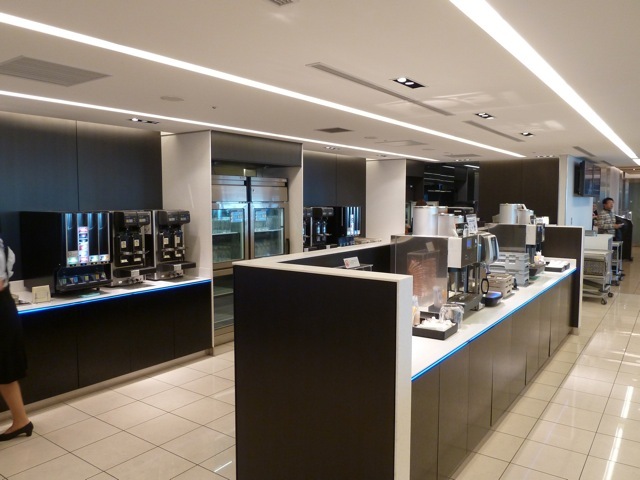 The queues here are much shorter and the staff take their time to actually help you repack your stuff once you’re through security. If only it were always like this! 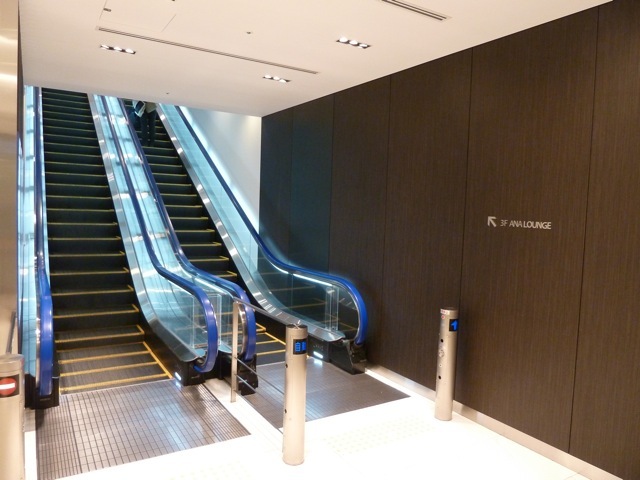 Once you exit security, there is an escalator on your right leading up one floor to the ANA lounge. 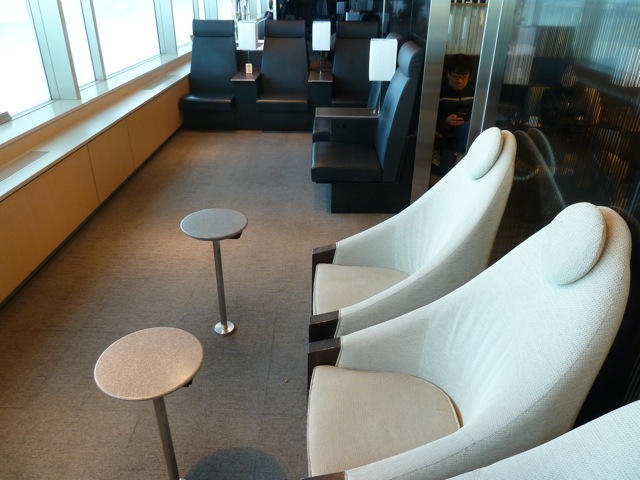 The ANA lounge is large and spacious, with plenty of seating options. Of course I follow my impulse, which is so much nicer than to call it a compulsion, to take a seat by the window where I can watch the action on the ramp, but I quickly change my mind. First of all, once you’re seated you can’t see the action outside anyway. 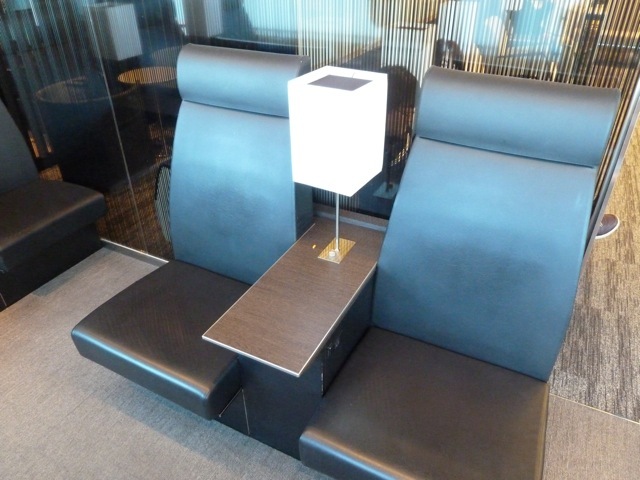 Secondly, the seating area by the windows is markedly hotter than the rest of the lounge. It’s like a sauna. The flight today is completely full. 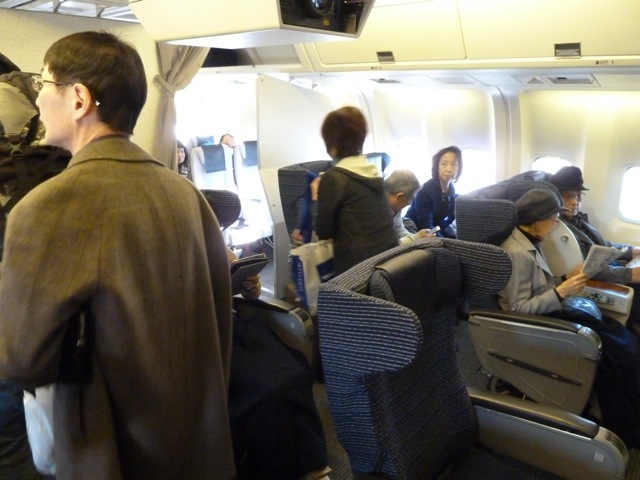 Boarding a flight in Japan is usually quite interesting to watch, and today’s flight does not appear to be any different in that respect. 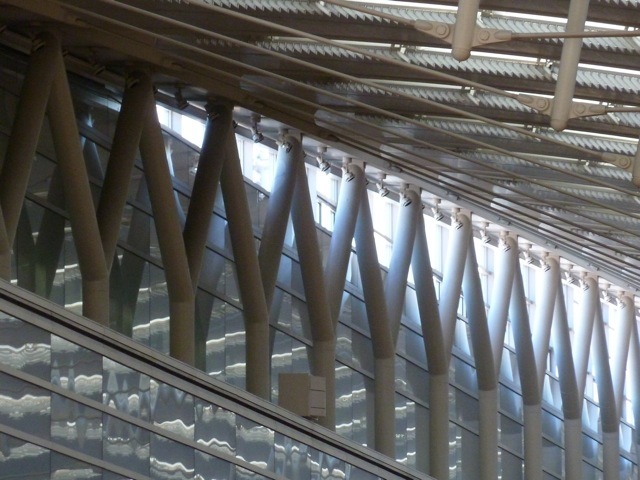 The first boarding announcement is for passengers with reduced mobility, and passengers travelling with children. 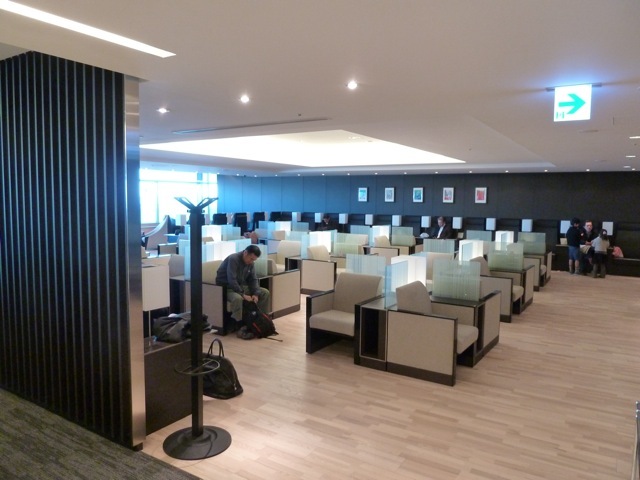 Next it’s the Star Alliance members and passengers in Premier Class. Boarding starts at 11:20, only 10 minutes ahead of our scheduled departure time, and I’m seriously wondering how much longer we’ll be on the ground here in Haneda. 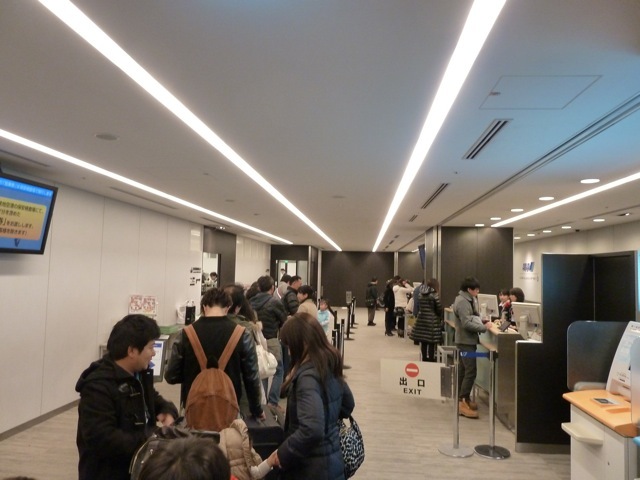 But when push comes to shove the Japanese will make that extra effort to achieve a group objective and much to my surprise, at 11:30 everyone is seated and the doors close for an on time departure to Ishigaki. Take-off is from runway 23. As soon as we’re airborne, we do a sharp right turn to point us in a southerly direction. It’s a lovely day here in the Tokyo area and our route takes us nearly exactly above Fuji. Unfortunately though, I’m unable to take any decent photos. I’m on the aisle seat and the guy by the window keeps leaning forward to get a better view. B 767 variety and have not been replace with the new B 777 style ones. 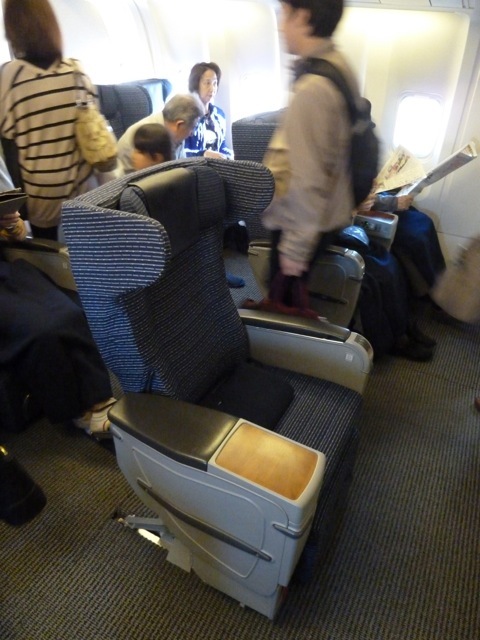 The seat is comfortable enough, but there is no individual IFE and the seat controls are mechanic rather than electric. 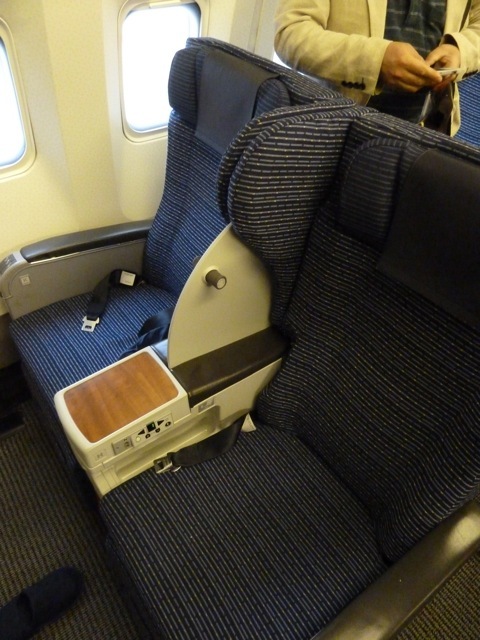 The seating configuration is 2 – 1 – 2, with the designation AB for the row of two on the left, D for the single seat and HJ for the row of two on the right side of the aircraft. 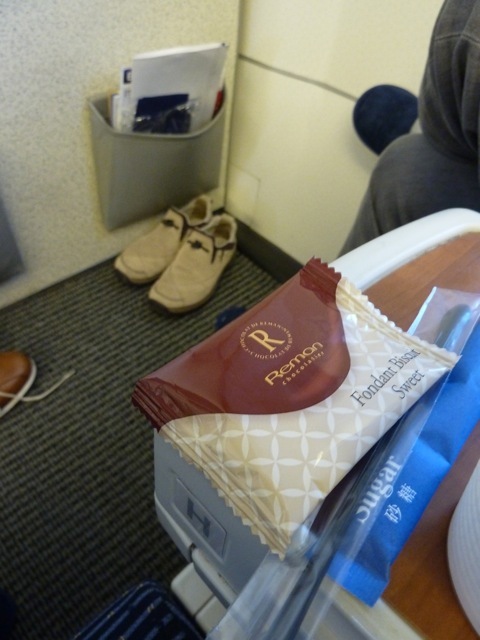 Every passenger has a blanket and a pair of slippers at his seat. Pillows are also available on request. There are two cabin crew working in Business Class this morning. One is the middle-aged maître de. Very stern and competent. And then there is a charming young lady, who is very personable and witty. 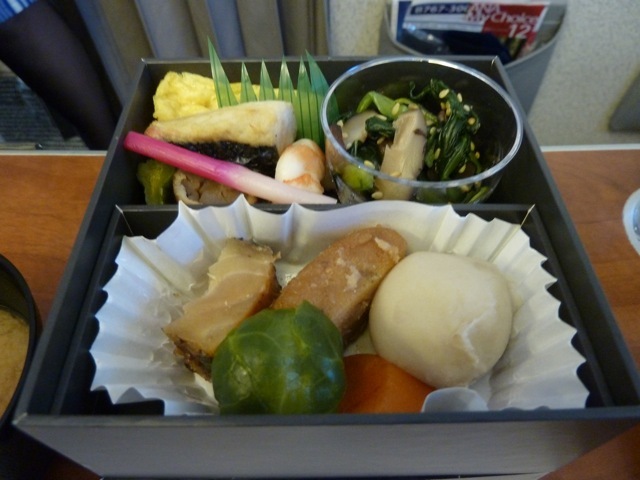 The meal is very tasty and very Japanese. 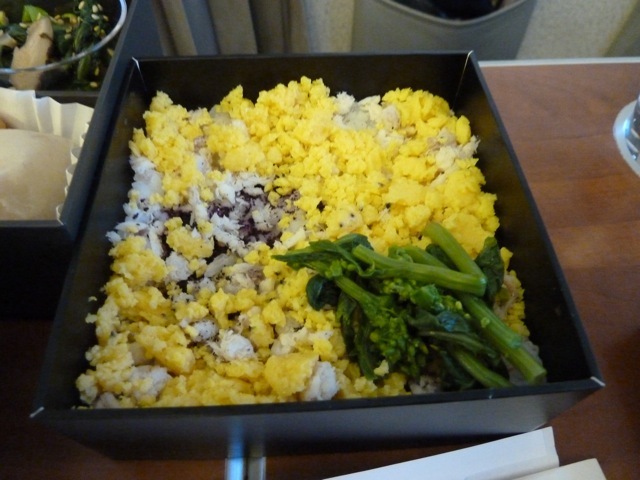 It’s a two layered bento box with a variety of dishes, mostly fish, vegetables and rice. 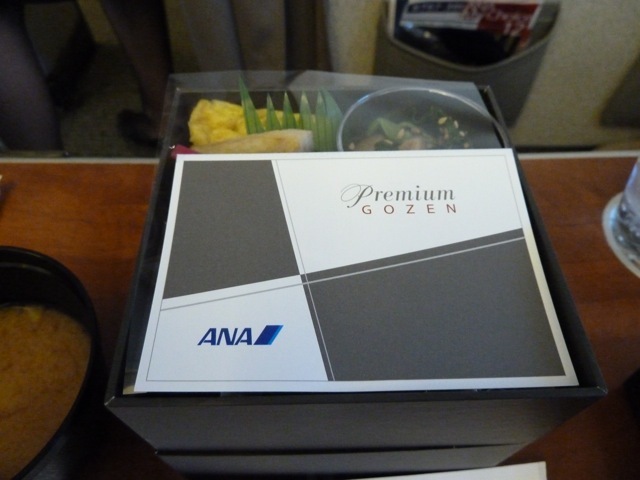 There is a menu in the box, but that is only in Japanese. So I can’t really tell you exactly what it is you can see in the pictures. 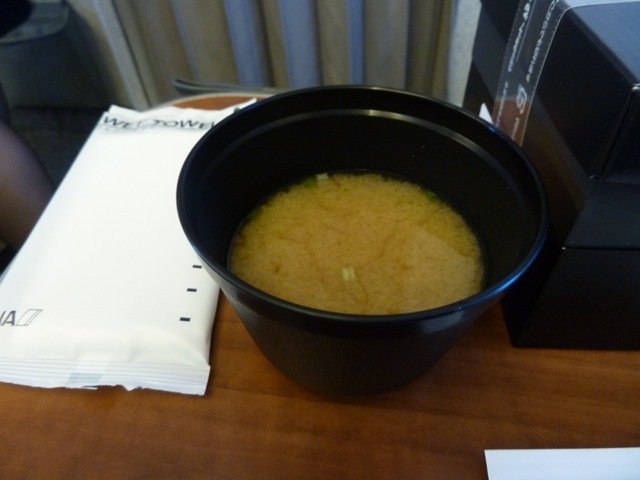 Miso soup is served with the meal. To drink I have a cup of Perrier. 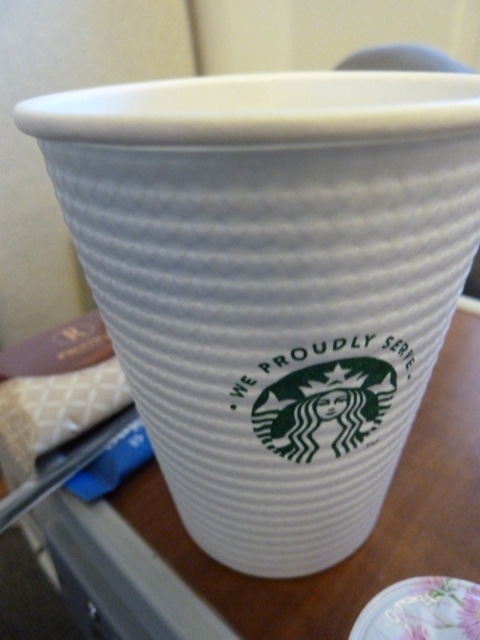 And then to conclude the meal I have a cup of Starbuck’s branded coffee and a chocolate fondant biscuit that is so divine I have to ask for a second one. 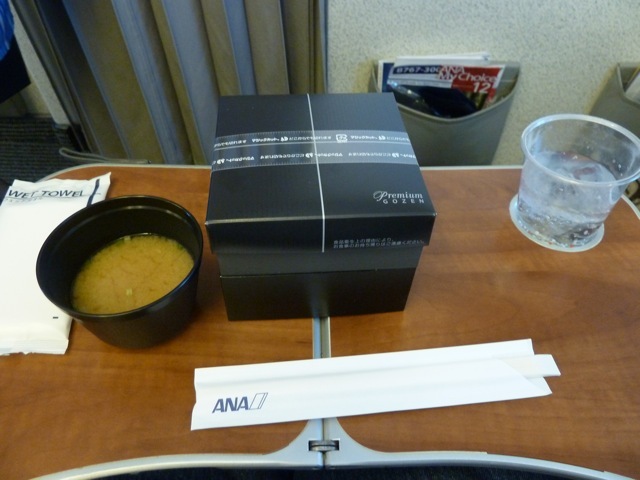 ANA’s premium meal concept on domestic flights is quite simple, but it serves its purpose well – the bento box and miso are rather nice. For the rest of the flight I listen to my own music. 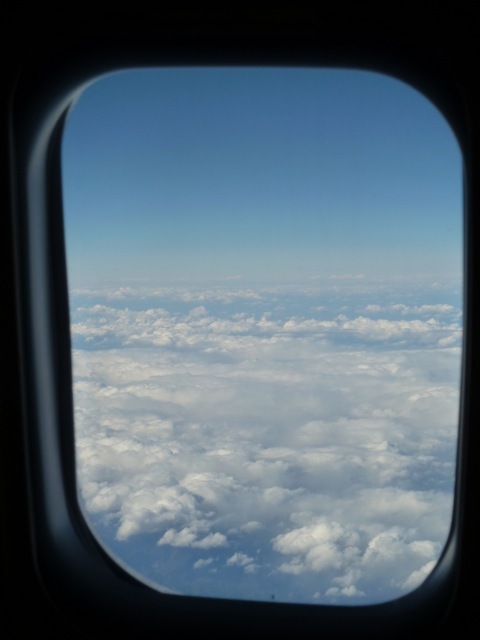 Throughout the flight the crew pass through the cabin regularly to ensure that passengers are comfortable and to check if any one needs anything. One hour out of Ishigaki there is another drinks service, which is accompanied by a basket with savoury and sweet snacks. 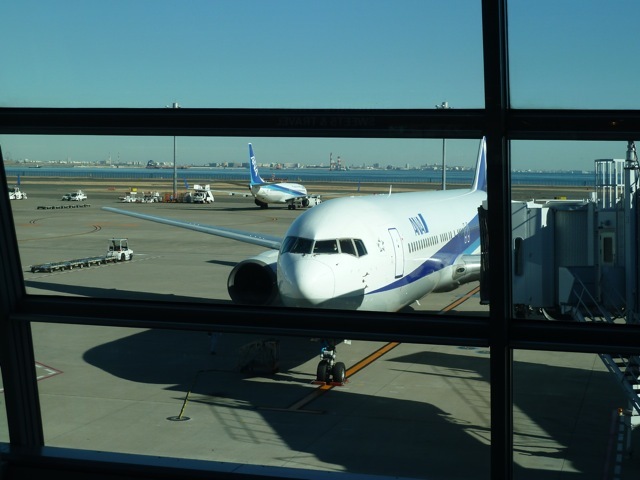 As I already mentioned, it was a lovely day when we departed from Haneda this morning. Unfortunately though I can’t really say the same about Ishigaki. It’s definitely warmer, but that’s about it. It’s quite windy and it’s raining – perfect weather to lounge around inside and read a good book or two. Which is, I think, what I shall do until the weather clears. 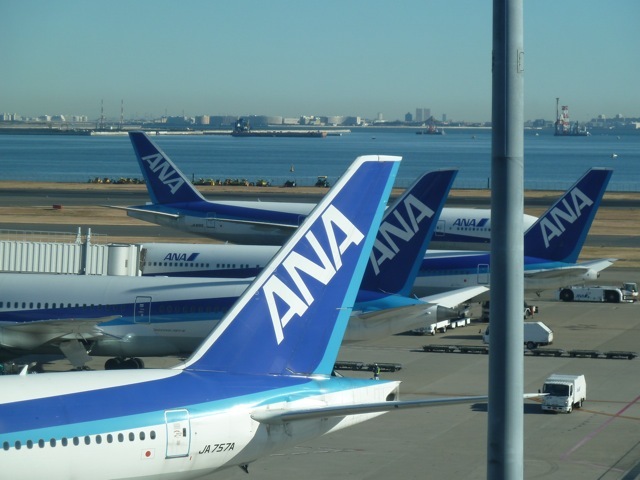 This entry was posted in ANA - All Nippon Airways, Boeing B 767-300, Business Class and tagged airlines, all nippon airways, ana all nippon, aviation, business class passengers, business class seat, Haneda, Haneda airport, Ishigaki, leisure traffic, Narita Express, transportation, travel, vacation. Bookmark the permalink.